How do I use a promo code when I order? Please make sure to review the terms and conditions of the promotional code. We begin to fill your order immediately after it has been submitted. If you would like to cancel your order -- you can contact our customer service department, and we'll do our best to stop the shipment. If we are unable to, you may choose to simply return the order -- just follow the return instructions that came with your shipment. 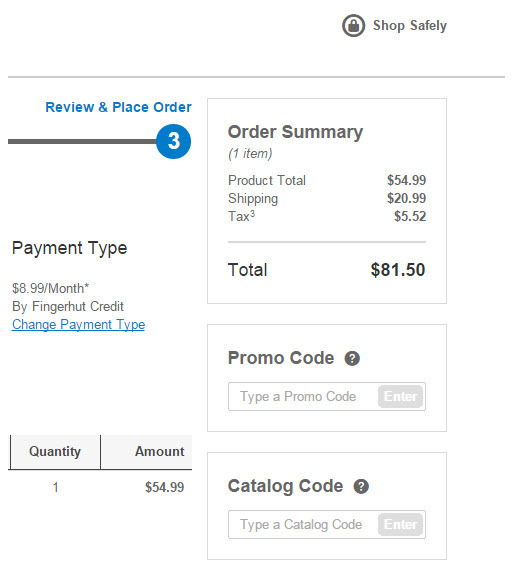 How do I track my Fingerhut order? If you have provided us your email address, when your order ships, we will send you an email with your tracking information. You may also view the status of your order by signing in to your account and going to My Orders on the left side. Click on Order History. If it has been five (5) or more days since the delivery date of your package, download an affidavit form to assist us with researching your package. It is also important to double check the area surrounding your residence including your porch or garage, ask your neighbors or building manager. Once you have filled the form out, email it back to us for faster service. We will conduct an investigation and respond to you typically within 3 days to let you know the result of our investigation. Click here to download an affidavit. I have not received some or all of the products I ordered. You may view the status of your order by signing in to your account and going to My Orders on the left side. Click on Order History. If we have your email address on file, we will send a confirmation email when your order is shipped. This email will include your tracking information. Please note that we only send confirmation emails for items shipped from our warehouse. If it has been five (5) or more days since the delivery date, download an affidavit form to assist us with researching your package. It is also important to double check the area surrounding your residence including your porch or garage, ask your neighbors or building manager. Once you've filled the form out, email it back to us for faster service. We'll conduct an investigation and respond to you typically within 3 days to let you know the result of our investigation. Click here to download an affidavit. Can I use more than one method of payment on my order? You may use your WebBank/Fingerhut Advantage credit, and a debit card to complete your order. After your first order you may use your Advantage credit and a credit card or debit card. You may use your WebBank/Fingerhut FreshStart credit to place an order and a debit card to make your down payment. You may use a debit card to pay the order total over your FreshStart credit limit, in addition to the down payment. How do I get free gifts from Fingerhut? One of the best things about ordering from Fingerhut is getting free stuff! Free gift promotional codes will be available periodically on the website. To receive an advertised free gift, enter the free gift promotional code during checkout. Please remember, only one promotional code is allowed per order! Online: Sign in to your account. When you find an item you would like to purchase, select Add to Cart. You will be prompted to check out or to continue shopping. We will call if we have any questions! Phone: Call 1-800-603-7052 any time day or night to place an order with one of our representatives! How do I use a gift card to pay? During the online checkout process, you will be given the option of using a gift card for payment. How do I shop on the website? For new customers, click here to register on Fingerhut.com! Will you have a Spanish language website in the future? While we have decided to discontinue the Spanish language version of the website, there remains the possibility that we will have a Spanish language website in the future. We will continue to remain committed to serving our Spanish speaking customers. Where is the Spanish language website? We are very committed to serving our Spanish speaking customers. However, due to low traffic, we have decided to discontinue the Spanish language version of www.fingerhut.com. We found that the majority of our website users utilized the English language version of the site. ¿Dónde está la página web en español? Estamos dedicados a servir nuestros clientes de habla hispana. Sin embargo, debido a tráfico bajo, hemos decidido descontinuar la página web de fingerhut.com en español. Descubrimos que la mayoría de los usuarios de la página web usan la versión en inglés. ¿Tendrán una página web en español en el futuro? Aunque decidimos descontinuar la versión de nuestra página web en español, existe la posibilidad de que tengamos una página web en español en el futuro. Continuamos dedicados a servir nuestros clientes de habla hispana. Items can be returned or exchanged in original condition within 60 days. Returns will not be accepted after 60 days. Refunds will be made in original form of payment. Shipping and handling charges are non-refundable. Return postage is the responsibility of the customer. Some returns may be subject to an additional Return Shipping Fee. Product concerns beyond the return period must be handled under the manufacturer's warranty. If you use your WebBank/Fingerhut Credit Account or WebBank/Fingerhut FreshStart Credit Account, you must continue to pay the minimum amount due according to your monthly billing statement until your return has been processed and the credit is reflected on your statement. If the minimum payment is not received, you may be assessed late fees and could negatively affect your credit bureau reporting. Mobile devices can be returned only if defective or damaged and exchanges are for an identical device within 30 days. Music, movies, video games, and software must be returned unopened with the factory seal intact and exchanges are for identical item only within 30 days. Computers, televisions, tablets, e-readers (and other devices that connect to the internet), camcorders, digital cameras, video game systems, drones, air conditioners, heaters, generators, air mattresses, and holiday decorations must be returned within 30 days. Items that are damaged and not returned in original manufacturer's packaging may be denied a refund or exchange. Swimwear must be in original condition (cannot be washed or worn) with original tags and protective slip intact. Tires cannot be returned if they have been used, mounted, or damaged. Mattresses, mattress sets, box springs and foundations that are oversize (ship codes "o" through "r") must be inspected upon delivery and delivery must be refused if damaged or defective. Products sold in sets must be returned as complete sets; partial returns will not be accepted. Personalized or customized products can only be returned if damaged or defective and exchanges are for identical item only within 30 days. Gift cards and perishable items cannot be returned. What if my item is damaged, defective or isn't what I ordered? Let us make it right. You can use the pre-paid return label you may have received in your package. If you did not receive one with your packaging, sign in to your account and go to My Orders on the left side. Click on Returns Center to print a new return label. For defective items (not FitBit or Onkyo), please contact the manufacturer first to report any defects. If the manufacturer advises you to return the item to Fingerhut, please utilize the pre-paid return label in your package or visit our Returns Center. For defective FitBit or Onkyo items, please use the pre-paid return label or visit our Returns Center. Once shipped, only defective or damaged devices can be exchanged for an identical device on phones. Defective or damaged exchanges must be within 30 days of purchase. If you do not have your return label or packaging slip, just sign in to your account and go to My Orders on the left side. Click on Returns Center. Select the order and the items you would like to return and hit the Print Label button. A packaging slip will be included in your print outs. How do I return or exchange something I bought? Note: Pre-paid return labels are not available for truck-ship items, oversized items or Fingerhut FreshStart accounts. Contact Customer Service to help with your return. For more detailed information on returns see What is Your Return Policy? Let us make it right. You can use the pre-paid return label you may have received in your package. If you did not receive one with your packaging, sign in to your account and go to My Orders on the left side. Click on Returns Center to print a new return label. For more detailed information see What if my item is damaged, defective or isn't what I ordered? What if I placed my order with a Fingerhut Gift Card? Credit will be applied back to the Fingerhut Gift Card that was used for your purchase upon receipt of the return. It typically takes 10 days from the time you mail your item to us to receive it. If you provided us with your email address, we will email you when your account has been credited. You can also check on your return status and available credit by signing in to your account and going to My Orders on the left side. Click on Returns Center. Gift cards cannot be returned. How long will it take to receive my return credit? It typically takes 10 days, from the time you mail your item to us to receive it and credit your account. If you provided us with your email address, we will email you when your account has been credited. You can also check on your return status and available credit by signing in to your account and going to My Orders on the left side. Click on Returns Center. I misplaced or did not receive a return label. How can I get another return label? Note: Pre-paid return labels are not available for oversized items or Fingerhut FreshStart accounts in our Returns Center. Please follow the return instructions on your packing slip or contact us for more information on these types of returns. What if I don't have my packing slip? No problem! If you don't have your packing slip, you can print one off by signing in to your account and going to My Orders on the left side. Click on Returns Center. Or create your own. To print a packing slip: sign in to your account and go to My Orders on the left side. Click on Returns Center. Select the order and the items you would like to return and hit the Print Label button. A packing slip will be included in your print outs. What if I received this item as a gift? No problem! If you need to return an item that was received as a gift you can use the pre-paid return label you may have received in your package. If you did not receive one with your packaging, please contact us to request return postage. How do I return an item that was delivered to me by a trucking company (oversized)? We can help! If you need to return an item that was delivered to you by a trucking company you may require a special return label. Please contact us to request return postage. How do I return my Free Gift? Free Gifts do not need to be returned, even if you return the rest of your order. The Free Gift is yours to keep! If you received a damaged of defective Free Gift we can help! Please contact us to report any problems with your Free Gift. When will my return be credited or my exchange be sent? Once your return has been scanned by the shipper, we will display the tracking information in the Returns Center in the My Orders area of Fingerhut.com. Or, you can simply visit the shipper's website and enter in your tracking number. If you received a Smart Label, go to http://www.tracking.smartlabel.com/ and enter your tracking number. If it has been more than fifteen (15) days since you returned your package, download an affidavit form to assist us with researching your returned package. Once you have filled the form out, email it back to us for faster service. We will conduct an investigation and respond to you typically within 3 days to let you know the result of our investigation. Click here to download an affidavit. I misplaced my return label, how can I get another return label? If you do not have your return label or packing slip, sign in to your account and go to My Orders on the left side. Click on Returns Center. Select the order and the items you would like to return and hit the Print Label button. A packing slip will be included in your print outs. Note: Pre-paid return labels are not available for truck-ship items, oversized items or Fingerhut FreshStart® accounts. Contact Customer Service to help with your return. I want to return an item, but I don't have my packing slip? How long will it take to receive my credit for a returned item? It typically takes 10-15 days, from the time you mail your item to us to receive it and credit your account. If you provided us with your email address, we will email you when your account has been credited. You can also check on your return status and available credit by signing in to your account and going to My Orders on the left side. Click on Returns Center. What will I be charged for using my prepaid return label? The return fee is based on how much your package weighs. There are separate rate charts shown below for the carriers, including a separate chart for customers living outside the 48 contiguous states. Note: All products that are powered by a combustion engine, you must void the fuel tank of all liquid and fumes prior to mailing. Broken glass cannot be returned. Bottles containing flammable liquids (perfumes, canisters) must be tightly sealed before mailing your return. For more information, view the full Return Policy and our Returns Center. I returned my item to Fingerhut and you have not received it yet. If you return any item that is discounted as part of a purchase with purchase promotion, you will be credited for the item, less any discounts received. Why can't I ship my order to an address besides my billing address? When you place your first order with us, and you use your Fingerhut Credit, the billing and shipping address need to match. We do this for your protection as we want to ensure the order is being shipped to you, the account holder. Subsequent orders, you have the ability to change your shipping address. If you would like to change the address on your first order, you can use an alternate method of payment, i.e. Visa, MasterCard, Discover or American Express. You may view the shipping and handling charges here. Can all Fingerhut products be shipped with 2-day shipping? The product and shipping address must be eligible for the 2-day shipping option. Backordered items, oversize items, orders shipped directly from the manufacturer or products that cannot be shipped by air do not qualify for 2-day shipping. The 2-day shipping option is available within the 48 contiguous states, excluding APO/FPO addresses and PO Boxes. Our checkout process will not provide the 2-day shipping option when you are trying to order an item that is not eligible. Standard shipping will vary by the location you are shipping the order to, but typically means your order will ship and be delivered within 5 to 7 business days. Additional shipping time may be needed if you order an item that is personalized either with monogramming or engraving, or if an item you order is oversized like furniture or appliances. You can get updates on the status of your order by signing in to your account and going to My Orders and clicking on Order History. If you'd like a faster option, we also offer 2-Day Shipping on some items. What does 2-Day Shipping mean? 2-Day Shipping means your order will leave our warehouse within 1 business day and should be delivered within 2 business days after that. There is an extra fee of $14.99 per item for 2-Day Shipping and some restrictions apply. What does "Ships directly from supplier" mean? These are products that are shipped to you directly from the supplier or manufacturer (also referred to as drop ship). When you order an item that is shipped to you directly from the supplier, we will notify you the expected delivery date. Because we are not the shipper, we are not able to guarantee delivery date or provide a 2-day shipping option. Curbside delivery is offered for heavier items. You pay shipping and handling charges for delivery to the curb in front of your address. If you want the item carried into your house, please arrange it with the company delivering the item. Most of the time, the company will charge extra for this service. We are happy to ship most items to any United States Post Office address. This includes APO and FPO addresses. We just can't offer the 2-day shipping option to an APO or FPO location, or PO Boxes at this time. Also note we are not able to ship Drop-ship or send oversized items to an APO or FPO location, or a PO Box. Some items can be shipped to a PO Box. If an item cannot be shipped to a PO Box, we will ask you to provide a physical address. If you do not provide a street address, you will be responsible for the original and return shipping and handling. What if I live outside the 48 states? You can place an order at any time! For orders shipped to an address outside the 48 contiguous states we add a $24.99 surcharge per order to help cover shipping costs. This includes AK, HI, US territories and APO/FPO addresses. What are deferred payment offers? You may be eligible for Deferred Payments, which are periods of time when you are not required to make payments on a specific purchase. Special rules apply to Deferral Periods: The date, amount and description of each purchase is identified on your Statement for the period when you make the purchase; each Statement contains a summary of all deferred purchases, including the unpaid principal balances, any interest charges and the dates until which payments are deferred. The deferral plan offered to you is made at the sole discretion of WebBank (as implemented by Fingerhut) and cannot be changed by customer request. Monthly payments on the deferred purchase are not required during the Deferral Period. Interest will be charged at the monthly periodic rate on your deferred purchase from the date of purchase. Interest charged during the Deferral Period will be added to your deferred balance, even if you pay off your deferred balance before the expiration of the Deferral Period. The amount of your deferred purchase(s) is/are not considered when we calculate your minimum monthly payment. We do consider your deferred purchase(s) for purposes of determining your available credit. Please note: To ensure qualified orders are placed on deferral, provide your Catalog Number or promotion code at the time of the order. Orders placed without this information will not be placed on deferral. My payment is due 5 days before I am paid every month, are you able to change my due date? We know that at times a due date may not work. We can change your cycle date one time in a 12 month period. To contact our Customer Service Department via email, please click here and complete the simple form. Unfortunately, because this account is an installment loan, we are unable to make any changes to your due date or the date your statement is sent to you. How do I get a credit line increase? We review accounts several times a year systematically. As your credit profile changes, we may reduce or increase your credit line. Continuing to make payments on time may make your account eligible for an increase. Please note, we are not accepting requests for credit line increases at this time. If your account is eligible at the time of systematic review, you will be automatically given an increase and notified by regular mail, an email or messaging on your monthly statement. Missed payments may reduce your credit line if your account becomes delinquent. What if I forgot my username, password or security questions? If you have forgotten your username or password please click the link called Forgot Password? when on the Sign in page. If you are still having trouble, please call Customer Service at 1-800-208-2500 8AM - 8PM (CT), Monday - Friday for help. If you do not remember the answers to your security questions, after several tries you will be asked to reset them. For your protection, Customer service cannot change your security questions. How do I make a payment on my WebBank/Fingerhut Advantage Credit Account? Online: Sign in to your account and select My Account at the top of the page. On the left side of the page select under My Account select Make a Payment. From there, you can select a one-time payment or set up recurring payments. We accept checking/savings accounts, Visa, MasterCard, and American Express. Bank Bill Pay: You can make your payments electronically using your checking or savings account if you have a bill pay service. You can find your 16 digit account number and our address on your statement. Automated Phone System: Call 1-800-208-2500 to make a payment through our automated system any time day or night. Checking/Savings, Credit and Debit cards are accepted. Walk In: You can pay your bill using CheckFree. Use the Payment Center Locator to find a location near you. CheckFreePay will send the payment to Fingerhut directly. Payments made before 11:00 pm Central Time will be credited to your account the same day. Payments made after 11:00 pm will be credited to your account the following day. How can I view my current account information and past statements? Sign in to your account and select My Account at the top of the page. On the left side click the Statements link. You may also download past statements. Tired of receiving lots of mail? Sign up for eStatements! View the terms and conditions of our eStatements by clicking here. What will my WebBank/Fingerhut Advantage Credit Account monthly payment amount be? Monthly minimum payments due for your WebBank/Fingerhut Advantage Credit Account are calculated based on the payment chart available on Fingerhut.com. Please note that you can pay more than the minimum due or the entire balance at any time without penalty. Please see below to review the payment chart. What happens if I pay my bill late? Are there late charges? The minimum amount due must be received no later than the due date. If not, your account may be charged a late fee. Please review the Terms and Conditions of your credit account by clicking here. Why should I have a Fingerhut online account? A Fingerhut.com account makes shopping fun and easy! You can check how much credit you have, track and/or view orders, personalize your account, sign up for and see online statements, and even pay your bill online. You can also receive special deals, make changes to your address online, start a wish list, learn how to read your statement, tell us how you want us to contact you and much more! Just click on Hello. Sign In on the top of any page. All you need is your Fingerhut customer number from the back of your catalog, an email address and password. If you need help, please call Customer Service at 1-800-208-2500 8AM - 8PM (CT), Monday - Friday. Will a bad payment history hurt me in the future? Yes, a bad payment history has a negative impact to your credit. A bad credit history can raise your APR and minimum monthly payments, lower your credit limits, and more. A bad payment history forces the lender to take on a greater risk. Where is my return credit? It typically takes 10-15 days from the time you mail your item to us to receive it and credit your account. If you provided us with your email address, we will email you when your account has been credited. You can also check on your return status and available credit by visiting the Returns Center in the My Orders section of Fingerhut.com. How long does it take for my payment to show up on my account? You will see your payment on your account within 1-2 business days. Please note that your available credit will update immediately. How do I log off of fingerhut.com? Just go to My Account at the top of any page and click on Sign Out. How can I pay less in interest charges? Paying your balance in full or paying more than your minimum amount due will lower your interest charges. When will I get my first billing statement? You will receive your first statement 30-45 days after making your first purchase. You can also see your statement information online. How do I sign in to my online account? Just click on Hello. Sign in at the top of any page on Fingerhut.com. Can I use my catalog and customer number to sign in to fingerhut.com? Your Fingerhut customer number and catalog number are linked to your Fingerhut.com account, but they are not the same. For your protection, we do not allow you to login using either your catalog or WebBank/Fingerhut Advantage Credit Account. 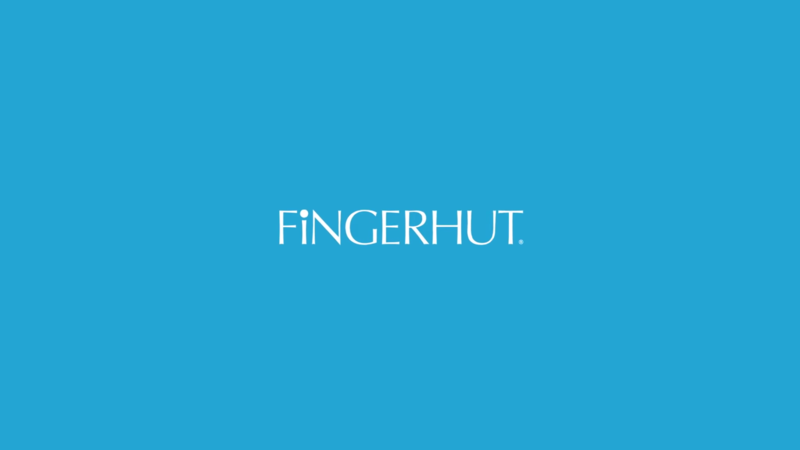 If you do not have a Fingerhut.com account, you can easily create one. Click here and fill in your information under the Register on fingerhut.com section. Once you sign in to your new account you will be able to view your WebBank/Fingerhut Advantage Credit Account information. How do I know my payment was received? You will receive a payment confirmation number when you pay by phone or online. For mailed payments, please allow 7-10 days for us to receive and process the payment. Keep your confirmation number for your records. What if I have a charge on my bill that doesn't look right to me? Fingerhut sometimes works with other companies that have products or services that we think our customers might like. But, you will never be billed for something you do not order. If you do order a product or service from these companies, they are billed to your WebBank/Fingerhut Advantage Credit Account; we do not fill these orders or run the programs. If you buy a product or service from these partner companies, you'll see the charge and the company name and phone number on your Fingerhut bill. Please call them if you have any questions about their programs. How do I make the monthly payments? Online: Sign in or register by clicking the Hello. Sign In link at the top of the page. Click the Make a Payment button on the Account Overview page. Bank Bill Pay: You can make your payments electronically from your checking or savings account if you are already using a bill pay service. You will find your 16 digit account number and our payment address on your statement. Automated Phone System: Call 1-800-208-2500 to make a payment through our automated system any time day or night. Payments are posted to your account within 48 hours of submitting. The payment will reflect the date it was submitted and not the date it was posted. If your payment is submitted on or before the due date indicated on your statement, no negative activity will be associated with your account, such as a late fee. Important Information: FreshStart® payments must be made with a debit card or checking/savings account. We do not accept Credit Card payments with this type of installment loan. Paying your monthly bills on time and in full guarantees your reward of a revolving WebBank/Fingerhut Advantage Credit Account. A single late payment will prevent you from graduating to your new account. A late fee will be charged if your payment is not received by the due date. Any late fees you incur on your account will be added as a final payment up to one month after your final installment. Can I pay my account off early without penalty? Yes you can! There is no charge or penalty to pay off your balance early. Once you've received your order, pay it off any time. What will my monthly Fingerhut FreshStart® Account payment amount be? Your monthly payment will be based on your order amount plus shipping and handling, taxes, and finance charges. The total order amount minus the $30.00 down payment will be split equally over the remaining monthly payments. This will be reflected on your monthly statements. When you place your first order and make your down payment you will receive an Installment Loan Agreement by regular mail, which will include the anticipated monthly payments for your purchase. You can also see your monthly payment amount online by creating an account and going to the My Account Overview section and selecting Statements. You can make your down payment online or by calling 1-800-208-2500 8AM - 8PM (CT), Monday - Friday. Debit Cards - using your debit card will ensure your order is shipped to you quickly! Credit Cards and saving accounts are not accepted for payments with the FreshStart® Program. You can also mail a check or money order for your down payment. Use the address below that corresponds with your credit account type. Please note that this option takes longer, since we have to allow for the time it takes to be mailed to us, and for us to process it. Please be sure to include your customer number on the check or money order. Your customer number can be found on the back of your catalog, highlighted in yellow or in My Account on Fingerhut.com. Your in-stock order will ship when our hold time has passed. If your order is not in stock, you will be notified. We will hold your order for the number of days listed above and then your order will be released for shipment. Note that these timeframes are not flexible. Please allow up to 10 days from the end of the hold time for your order to be shipped and received by you. How do I apply for a WebBank/Fingerhut Advantage Credit Account? To apply online, click here! If you are not signed in, you will be prompted to sign in as a new or existing customer. If you are a new customer, and have a Customer Number that you received through email or mail, be sure to include that information before applying. If you do not have a Customer Number, just click "No, but I still wish to apply." Next, fill out the application and within minutes you will find out if you have been approved. What is the Fingerhut FreshStart® Credit Account issued by WebBank? The Fingerhut FreshStart® credit account issued by WebBank is an installment program that can help customers build buying power with us. Once approved, you would make a one-time purchase that is a minimum of $50.00 (includes shipping and handling and taxes). Next, a $30.00 down payment is required for your order to ship and to continue with the program. This amount will be subtracted from your order total. Debit Cards - using your debit card will ensure your order is shipped to you quickly but will take 2 days for your down payment to complete processing before your order is shipped. Electronic (ACH) Check - there is a 7 day hold time when this method of payment is used, meaning your order could be delayed. Money Orders - in addition to the time it takes for you to mail it to us, there's also a 2 day processing timeframe. Paper Check - in addition to the time it takes for you to mail it to us, there's also a 7 day clearing time once we receive it, meaning your order could be delayed. CheckFree - there is a 7 day hold time when this method of payment is used, meaning your order could be delayed. Credit Cards and saving accounts are not accepted for payments with the FreshStart Program. Finally, pay off the balance with monthly on-time payments. Once your balance has been paid in full, with no late payments, no return payments, & at least a $50 minimum order, you will be rewarded with a WebBank/Fingerhut Advantage Credit Account that may have a higher credit limit! If your order is over your credit limit you can use a debit card to pay the difference. The down payment must be made at the time of purchase. If the down payment is not made within the 25 days from the date the order is placed the order will be cancelled. Why would I want to use the Fingerhut FreshStart® Credit Account issued by WebBank? The Fingerhut FreshStart® credit account is a smart, easy and affordable way to get the items you want today while building your buying power with us. It lets you shop thousands of brand names and high quality products at affordable low monthly payments. Paying your low monthly payments in full and on time may reward you with a revolving WebBank/Fingerhut Advantage Credit Account with a higher credit limit and no down payments. What can I buy using the Fingerhut FreshStart® Credit Account issued by WebBank? You may shop from the Fingerhut FreshStart® catalog or online at www.fingerhut.com. A credit score is a rating that results from looking at several pieces of information about your credit. A credit score is used by a lender to help decide whether or not you should be approved for a credit card, loan, or service. A credit score helps lenders decide the risk involved in extending a line of credit. Usually, the lower the score, the higher the risk. You can request a free copy of your credit report each year from each of the three credit bureaus. Go to www.annualcreditreport.com/or call 1-877-322-8228. A debt-to-income ratio is one way to measure how financially stable you are. You divide monthly minimum debt payments (excluding mortgage or rent payments) by monthly gross income. Your monthly gross income is what you make before taxes and anything else are taken out. The lower your debt-to-income ratio, the better off you are. A good debt-to-income ratio is less than 36 percent. If it's higher 36 percent, you should think about making some changes for a better financial situation. Fingerhut is very concerned about the safety and well being of our customers and their families. We intend to always treat our customers with courtesy and respect. The customer relationship is a very important part of our business. We strive to provide our customers with products that meet or exceed our quality standards, and your expectations. Our quality and safety standards comply with applicable domestic safety laws, and we expect our suppliers to comply with those same laws. On rare occasions, our suppliers may discover a product safety concern after an item has already shipped to our customers. When this happens, our Fingerhut Quality Assurance team will work closely with our suppliers and the U.S. Consumer Product Safety Commission to make sure our customers are notified about product recalls. We have made this section of our web site available to customers to ensure that you have all of the most up to date information about recalls that may affect our customers. For more information about product recalls and safety information, please visit this U.S. Government Web site: www.recalls.gov or call our Fingerhut Customer Service department at 1-800-208-2500 8AM - 8PM (CT), Monday - Friday. Your satisfaction is important to us, and we thank you for your business. We understand the trust you place in us, and want you to know that we are doing everything we can to continue to provide a great shopping experience with high quality products. I want to cancel SafeLine®. SafeLine® Account Protection Plus is an optional benefit on your account and you may cancel at any time. You can cancel your coverage in two ways: first, by calling SafeLine Services at 1-855-582-2128 or, second, by writing to SafeLine Services, P.O. Box 740237, Atlanta GA 30374-0237. A customer service representative will be able to cancel your coverage, and if no benefits were paid, would be able to credit your account the current month's SafeLine fees. I purchased an extended warranty or Service Plan. How do I file a claim? Please contact Asurion Service Plans at 1-866-813-2931 or at asurion.com/fingerhut as they are the company that is providing the Service Plan. They are open 24 hours a day, 7 days a week. An agent there can work with you to initiate your claim. Can I get an Extended Warranty for my product? On many products, yes! You can protect your purchase and add to your peace of mind with an extended Service Plan. You can add a Service Plan during your product purchase, or within 30 days of your purchase. The Service Plan begins after the manufacturer warranty expires. If your product fails for any covered reason, it will cover parts and labor or will replace your product at no extra cost. Full Coverage for Parts and Labor. No deductibles. No hidden charges. A great value with retail prices as low as $6.99. To purchase a Service Plan after your initial purchase, simply call Customer Service at 1-800-208-2500 8AM - 8PM (CT), Monday - Friday. Service Plans are not available in Virgin Islands, Guam, American Samoa, Federated States of Micronesia, Marshall Islands, Northern Mariana Islands or Palau. How does SafeLine® "cover my current month's minimum payment" on my account? The term "cover your current month's minimum payment" applies when your benefits are activated by a qualifying event and approved, like involuntary unemployment or having a disabling accident. This means that WebBank will credit the current month's minimum monthly payment of principal and interest due (referred to in the SafeLine Terms & Conditions as "Monthly Benefit Payment"), which does not include any past due or delinquent payments, on your credit account during the benefit activation period. You will not be required to make a payment on your credit account while your benefits are active. In addition, late, over limit, and SafeLine Account Protection Plus fees will not be assessed during a billing period in which benefits are active. Your account will be suspended, which means you will be unable to use your credit account while benefits are activated. Interest will continue to accrue on your outstanding balance, and during those billing periods no reports reflecting a deteriorating credit status with us will be sent to any credit reporting agency. What is a Manufacturer's Warranty? Many of our products are covered by the manufacturer for different periods of time. If your purchase is covered by a warranty, the information will arrive with your product along with manufacturer contact information. When or how do I activate my SafeLine® benefits? The best place for an overview of SafeLine Plus benefits is the SafeLine Account Protection Plus Plan Contract which would have been mailed or emailed to you when you enrolled in the program. You can also obtain a copy of the SafeLine Account Protection Plus Plan Contract by clicking here. You can initiate a benefit by calling SafeLine Services at 1-855-582-2128 or by going to the My Account section of our site and clicking on SafeLine on the left hand side. That will take you to a service site for SafeLine and you can choose to the ?submit a benefit? option. A completed Benefit Activation Application, along with any required documentation, can be returned to us for review by email at SafeLineService@fingerhut.com, by fax at 1-888-633-0674, or by regular mail at SafeLine Services, P.O. Box 740237, Atlanta, GA 30374-0237. Upon receipt, SafeLine Services will review the benefit request and follow up with you regarding your benefit status. When will coverage start once I have enrolled in SafeLine®? When you enroll, you will receive a SafeLine Account Protection Plus Plan Contract with all the Terms and Conditions via e-mail or mail within 5-7 business days. You must be enrolled in SafeLine Account Protection Plus for at least one month prior to requesting the benefit activation due to hospitalization, unpaid leave of absence, major life event, or disability and at least three months prior to requesting the benefit activation due to unemployment or death (except in the event of accidental death which is covered during the first 90 days). Please refer to the SafeLine Account Protection Plus Plan Contract regarding eligibility requirements, conditions, and coverage exclusions. How do I initiate a SafeLine® claim/benefit? The best place for an overview of SafeLine Plus benefits is the SafeLine Account Protection Plus Plan Contract which would have been mailed or emailed to you when you enrolled in the program. You can also obtain a copy of the SafeLine Account Protection Plus Plan Contract by clicking here. You can initiate a benefit by calling SafeLine Services at 1-855-582-2128 or by going to the My Account section of our site and clicking on SafeLine on the left hand side. That will take you to a service site for SafeLine and you can choose the ?submit a benefit? option. A completed Benefit Activation Application, along with any required documentation, can be returned to us for review by email at SafeLineService@fingerhut.com, by fax at 1-888-633-0674, or by regular mail at SafeLine Services, P.O. Box 740237, Atlanta, GA 30374-0237. Upon receipt SafeLine Services will review the benefit request and follow up with you regarding your benefit status. There is a SafeLine® Account Protection Charge on my account, what is this? Fingerhut credit account holders are able to take advantage of this optional SafeLine® Account Protection Plus Plan from WebBank. This program provides protection in the case of hospitalization, major life events, unpaid leave of absence, involuntary job loss, disability, or even death. Refer to the SafeLine Account Protection Plus Plan Contract for complete details, including eligibility requirements and coverage benefits or limitations. You may have elected to enroll in this program when you applied for your Fingerhut credit account issued by WebBank or through communications via the My Account page, your statements, or while you were ordering. You may cancel at any time. What is SafeLine® Account Protection Plus? SafeLine Account Protection Plus is an optional program offered by WebBank. SafeLine can help reduce stress and worry should the unexpected happen like getting laid off, becoming disabled or hospitalized, or experiencing a major life event. When a covered event happens, SafeLine may make your current month's minimum payment so you don't have to worry about it for three (3) to twelve (12) months depending on the benefit coverage. The program may also waive your entire balance, up to your credit limit, in the event of your death, bankruptcy, foreclosure or for extended disability, unemployment, or hospitalization. SafeLine costs just one dollar and nineteen cents ($1.19) per month for every hundred dollars ($100) outstanding on your credit account statement at the end of each monthly billing cycle. If you don't have a balance outstanding on your statement, you don't have to pay anything and your coverage remains in effect. What is this charge I don't remember authorizing? How can I enroll in SafeLine®? It's easy. You can simply click on the "Yes, I want to enroll" option when reviewing your account information on the My Account page (click on the SafeLine link), when placing an order online - the SafeLine offer will be available during checkout, or when calling Fingerhut's order line at 1-800-233-3588 from 8:00am to 8:00pm Monday through Friday, Central Time. You may enroll in this coverage at any time when you are a WebBank/Fingerhut credit account customer in good standing. However, SafeLine is not currently available to customers in: AK, AS, FM, GU, MH, MP, PW or VI. Your choice whether to enroll or not will not affect any existing credit agreement with WebBank. Additional information may be required before a benefit is paid. Please refer to the SafeLine Account Protection Plus Plan Contract regarding eligibility requirements, conditions, and coverage exclusions. Am I eligible for SafeLine® if I am retired or self-employed? If you are unemployed, self-employed or retired at this time, you would not be eligible for the Unemployment or Leave of Absence Benefits. However, if you chose to enroll, you could be eligible for other covered events under SafeLine® Account Protection Plus, such as, for disability preventing you from performing a daily acts of living as certified by your doctor, hospitalization, a change in your primary residence, and other major life events. In the event of death, bankruptcy, and foreclosure, your balance could be paid in full up to your available credit limit. Refer to the SafeLine Account Protection Plus Plan Contract for complete details, including eligibility requirements and coverage benefits. Note that SafeLine Account Protection Plus costs the same to you regardless of whether you are eligible for only some of the benefits. Review the Terms and Conditions carefully to determine whether you are eligible for coverage before purchasing SafeLine Account Protection Plus. Note that you may cancel your enrollment at any time. How do I get SafeLine® charges removed? If you have contacted SafeLine Services and have been advised a credit will be issued to your account, please allow up to two billing cycles from the date of contact for the credit to appear on your statement. If two billing cycles have passed, please contact us by email at SafeLineservice@fingerhut.com or call us at 1-855-582-2128 for further assistance. What is the cost of having SafeLine®? SafeLine costs just one dollar and nineteen cents ($1.19) per month for every hundred dollars ($100) outstanding on your credit account statement at the end of each monthly billing cycle. If you don't have a balance outstanding on your statement, you don't have to pay anything and your coverage remains in effect. Who can enroll in SafeLine®? Close all unauthorized accounts that you are aware of. Contact those companies that have established unauthorized accounts using your personal information and advise them that you are a victim of identity theft. Request that the accounts be closed immediately. Ask the company for any assistance they can provide in handling the fraudulent account. There may be information you need to provide to these companies to ensure the accounts are closed. Place a fraud alert on your credit report and review your credit reports annually. Fraud alerts can help prevent an identity thief from opening additional accounts in your name. Contact any of the toll-free number below to initiate a fraud alert. The company you call is required to provide your information to the other credit bureaus. An alert will be placed on your credit bureau for you at each of the other bureaus. Contact the agency that issued the license or other form of identification. Follow their procedure to cancel the document and request a replacement. Ask the agency to flag your file so that no one else can request a license or any other form of identification in your name. File a police report for identity theft in your community or in the community where the identity theft took place. The police report can also be provided to the credit bureaus if a credit freeze is required to address the identity theft. File a complaint with the Federal Trade Commission. This information can be helpful to law enforcement officials across the nation in tracking down identity thieves. The FTC can refer victims' complaints to other government agencies and companies for further action, as well as investigate companies for violations of laws the FTC enforces. A complaint can be filed online at www.ftc.gov/idtheft. If you don't have internet access, call the FTC's Identity Theft Hotline toll-free at 1-877-IDTHEFT (438-4338); TTY: 1-866-653- 4261; or write to: Identity Theft Clearinghouse, Federal Trade Commission, 600 Pennsylvania Avenue NW, Washington, DC 20580. What if I don't want emails, mail or calls from Fingerhut? You can change your communication preferences by signing in to your account and going to My Profile on the left side. Click on Communication Preferences. Check your credit card and bank statements for inaccuracies. Check your credit report at least once a year. Look for what should and should not be there. Do not provide personal information to another individual or business unless they have a valid reason for requiring the information. Never write your credit card number or social security number on checks or the outside of an envelope. Do not give out account numbers over the phone to persons/companies you are not familiar with. Do not use a telephone, cordless or cellular, or an email to send financial or private personal information. Keep your financial documents in a safe/secure place. Do not pre-print your driver's license number on your checks. If you do, shred cancelled checks before you throw them away. Shred pre-approved credit applications, statements, or bills that contain personal information. Have your name and address removed from 'pre-screened lists'. Mail bills from the post office or your business, rather than your home mailbox. Consider having your name, telephone number, and/or address removed from the phone directory. Do not provide personal information over the phone unless you initiated the call and know who you are speaking with. If telemarketing companies call, advise them that you want to be added to their Do Not Call List. This is your right under the Federal Telephone Consumer Protection Act. Keep your birth certificate and social security card in a safe place. Do not carry these items in your wallet or purse. Choose passwords that will be difficult to crack and use different passwords for all accounts. Change passwords and PIN codes often. Use different PIN numbers for all of your cards/accounts. Do not store your PIN numbers on mobile phones or laptops. Do not put your Social Security number on any document unless you are legally required to do so. Shred any papers with financial information and identifiers instead of throwing them in the trash. We use the latest tools and technology to protect your personal information. To help with Internet security, it is highly recommended that you are very careful when sharing information such as full credit card numbers, social security numbers, driver's license, or any other important data. Note: If you are on our website using a public computer or share a computer with other people in your home, please make sure you sign out each time to prevent someone else from accessing your account. How does Fingerhut protect my privacy? Your privacy is important to us. We follow the rules set by the Direct Marketing Association's Privacy Promise to American Consumers. We will not share your information to other marketers/companies if you ask us not to. Identity theft occurs when a person uses someone else's identification in order to impersonate that person. You can visit the Federal Trade Commission Identity Theft Center by clicking here. Where is my customer number on the catalog? Your customer number is highlighted in yellow on the back cover of the catalog and can also be found on the Order Blank in the middle of the catalog. How do I get a Fingerhut catalog? Get your own Fingerhut printed catalog delivered right to your home! Click Here and complete the form to receive our catalog. Please allow 2-3 weeks for delivery. How do I find my catalog number? Your catalog number is highlighted in blue on the back cover of the catalog and can also be found on the Order Blank in the middle of the catalog. Can I order online with my catalog? Yes! You can always order from any Fingerhut catalog. Type in your catalog number, found on the back of your catalog, and the Item # into the Catalog Search drop-down box on the top of any page. When you use your catalog number, you get all the promotions offered on the catalog, like free gifts, pre-approved credit, deferred payments, and more. These offers are only for the person named on the catalog. When will I get my next catalog? We mail catalogs to customers all year long. If you have been ordering from us and your account is current, you'll get catalogs from us! Can I order from a friend's catalog? Sure! You can order from any catalog. Use the catalog number on the back to order online or over the phone, or use the order blank in the middle of the catalog. However, any pre-approved credit and deferred payments are only for the person named on the catalog. How can I continue to receive catalogs? By shopping with us and making your payments on time, you'll keep getting our great catalogs with exciting new items and great deals! Can I look at an online catalog? We do not currently offer an online catalog, but do offer products from our catalogs online at fingerhut.com, where you can find even more fantastic products! Will my MLA protections still apply if I graduate from a WebBank / Fingerhut FreshStart® Credit Account? Whether you will receive MLA protection for your WebBank/Fingerhut Advantage Credit Account upon graduating from a WebBank/Fingerhut FreshStart® Credit Account will depend on when you graduate and your status as a covered borrower at that time. If you graduate from a closed-end WebBank/Fingerhut FreshStart® Credit Account before October 3, 2017, the MLA protections will not apply to your new open-end WebBank/Fingerhut Advantage Credit Account. If you graduate from a closed-end WebBank/Fingerhut FreshStart® Credit Account after October 3, 2017 and you are a covered borrower at that time, the MLA protections will apply to your new open-end WebBank/Fingerhut Advantage Credit Account. If you graduate from a closed-end WebBank/Fingerhut FreshStart® Credit Account after October 3, 2017 and you are not a covered borrower at that time, the MLA protections will not apply to your new open-end WebBank/Fingerhut Advantage Credit Account. What protection does the MLA give me as a covered borrower? Written and oral disclosure. We must share the interest rates and other fees you owe, both orally and in writing, before your loan is issued. No mandatory waivers of consumer protection laws. We cannot require you to waive any state or federal law that protects you from being sued while on active duty. No mandatory arbitration. We cannot require you to arbitrate disputes about your account. No mandatory allotments. We cannot require you to make automatic paycheck deductions to repay your balance. No prepayment penalty. We cannot charge a penalty if you pay your balance early. When do the MLA protections become effective? For closed-end accounts, like your WebBank/Fingerhut FreshStart® Credit Account, the MLA protections become effective on October 3, 2016. For open-end accounts, like your WebBank/Fingerhut Advantage Credit Account, the MLA protections become effective on October 3, 2017. What is the Military Lending Act (MLA)? The Military Lending Act (MLA) provides credit account protections for service members placed on active duty and certain members of their family. The active duty service members and their families who are eligible for MLA protection are referred to as "covered borrowers." When is covered borrower status determined under the MLA? For closed-end accounts, like your WebBank/Fingerhut FreshStart® Credit Account, whether you are a covered borrower is determined at the time you make a purchase. For open-end accounts, like your WebBank/Fingerhut Advantage Credit Account, whether you are a covered borrowed is determined at the time you open your account. Who is a "covered borrower" under the MLA? For closed-end credit accounts, like your WebBank/Fingerhut FreshStart® Credit Account, you are a covered borrower if you are an active duty service member, their spouse, child, or other dependent at the time of purchase. This is effective October 3, 2016. For open-end accounts, like your WebBank/Fingerhut Advantage Credit Account, you are a covered borrower if you are an active duty service member, their spouse, child, or other dependent at the time you open your account. This is effective October 3, 2017. Where can I find more information about the MLA? To learn more about the MLA and how it may apply to your specific circumstances, you may contact your local Judge Advocate General's (JAG) office. Do I have to be a covered borrower to get MLA protection? Yes. You must qualify as a covered borrower to get MLA account protection. How long do the MLA protections last? The MLA protections remain in place as long as you continue to be a covered borrower. Will receiving a FICO® Score impact my credit? Because your FICO® Score is based on the information in your credit report, it is important to make sure that the credit report information is accurate. You may get a free copy of your credit report annually. To request a copy of your credit report, please visit: http://www.annualcreditreport.com. Note: Your free credit report will not include your FICO® Score. Why do credit scores fluctuate / change? A FICO® Score is based on the credit information in a credit file with a particular consumer reporting agency (CRA) at the time the score is calculated. The information in your credit files is supplied by lenders, collection agencies and court records. The FICO® Score that we provide to you is based on data from your report as of the 'pulled on date' shown with your score. How does Payment Rewards work? Payment Rewards is easy to use because once you are enrolled, everything is automatic! Payments you make on your WebBank/Fingerhut Advantage Credit Account earn 10% toward Payment Rewards. If you earn $5 or more in Payment Rewards by the end of the 3-month period, which requires total payments of at least $50, you'll be issued Payment Rewards in that amount that can be redeemed on a new Fingerhut purchase with your credit account. What happens if I join Payment Rewards in the middle of a period? Every customer who joins Payment Rewards gets the full value of all payments made in the period in which they join. Even if you join on the last day of a period, you'll get Payment Rewards based on all your payments in that period! If you want to stop participating in Payment Rewards, there is a link to unenroll in the "Learn About Payment Rewards" section of the website. What are the earning periods? Payment Rewards has four 3-month periods each year in which you can earn Payment Rewards. How much do I earn with each payment? During each 3-month period you'll earn 10% of the payments you make. The total payment amount is all new posted payments less any refunds or reversals. If you earn $5 or more in Payment Rewards by the end of the 3-month period, you'll be issued Payment Rewards in that amount that can be redeemed on a new Fingerhut purchase with your credit account. Is there a limit to the Payment Rewards you can earn? There's no limit to the amount of Payment Rewards you can earn. It's determined by the payments you make each period. However, you can't make payments for more than the amount of your account balance. How can I track my Payment Rewards progress? Sign in to My Account on fingerhut.com and look for the new "My Rewards" section. That page includes a Payment Rewards Overview that shows the estimated Payment Rewards for the current period as well as your Payment Rewards history. Will payments made on the last day of the earning period be included as part of my new Reward? A payment made toward the end of the period may not be part of the calculation for that period's Reward value, as payments can take one to three days to process. The good news is that we keep track of every payment used to earn a Reward, and if a payment made at the end of one period does not become a part of that Reward period's calculation, it will be applied to the following period's Reward. What happens to my Payment Rewards if I am late with my monthly payment? Once issued, your Payment Rewards will be available until they expire, but you must be able to make a purchase with your WebBank/Fingerhut Advantage Credit Account to redeem Payment Rewards. Keeping your account in good standing is the best way to make sure that you will be able to use your Payment Rewards. When can I use Payment Rewards? At the end of each period, Fingerhut will calculate the Payment Rewards you earned. If you earned more than $5, you will be issued redeemable Payment Rewards that will be available for use online or with phone order shopping. Payment Rewards are valid for use until the end of the next period. For example, if new Payment Rewards are calculated based on the payments you made in February, March and April, you can use those Rewards for a purchase in May, June or July. This process continues with each 3-month period. When will my Reward be available for redemption? At the start of each new period, it may take one or two days for your Reward to be processed and be visible on the Payment Rewards Overview page. Once it appears, it will also be available for redemption with a new purchase. Where can I find Payment Rewards information? Your most up-to-date Payment Rewards information is available online in the My Rewards section of My Account on fingerhut.com. Do I have to use a Payment Reward if it is available? No. During checkout you can choose to apply available Payment Rewards or save the Payment Rewards for another purchase. It's up to you. Just keep in mind that Payment Rewards expire at the end of each period. Why can't I use Payment Rewards on an order that is less than the Reward value? Payment Rewards can only be used on one order and we want customers to get the full value of the Rewards they earned. The only way to do that is by placing an order that is more than the value of their Payment Rewards. Why do I have to charge the balance of my Payment Reward purchase to my WebBank/Fingerhut Advantage Credit Account? This program is exclusively for WebBank/Fingerhut Advantage Credit Account customers, so the Payment Rewards can only be applied to purchases when using the WebBank/Fingerhut Advantage Credit Account. Can I use my Payment Rewards to pay for shipping and handling? Your Payment Rewards are applied to merchandise first, and if there is any Reward value remaining, it will be applied to shipping and handling charges. The purchase must be greater than the value of the Payment Rewards value, and the balance due must be paid with your WebBank/Fingerhut Advantage Credit Account. Can I give my Payment Rewards to a friend or family member? Your Payment Rewards can't be transferred to anyone else. Payment Rewards can only be used with your WebBank/Fingerhut Advantage Credit Account. Can I apply my Payment Rewards toward my monthly payment? Payment Rewards can be used only toward a purchase on your WebBank/Fingerhut Credit Account and cannot be used toward a payment on your credit account. When do Payment Rewards expire? Payment Rewards are valid for one 3-month period and expire at the end of that period. Check the Rewards Section of My Account to see the expiration date of Payment Rewards you have been issued. What if I return merchandise purchased with Payment Rewards? If Payment Rewards are applied to merchandise that you return, you will receive a credit for that amount in the next period. For example, if you return an item that you used $10 in Payment Rewards to buy in this 3-month period, a $10 Payment Rewards credit will be added to your Payment Rewards for the next 3-month period. How do my Payment Rewards get applied to a new purchase? Payment Rewards are applied to the most expensive item in your shopping cart first and will be applied to the next most expensive item until the Payment Rewards are fully used within that order. Can I get Payment Rewards credit for a return right away? For the best opportunity to re-use Payment Rewards, we apply any return credits to the next period's Payment Rewards. I have SafeLine benefits, how will that affect my Payment Rewards? If you are in an active SafeLine benefit period, you will continue to earn Payment Rewards at 10% of your SafeLine benefit payment amount -- just as if you were making payments. When your benefit period is over, and you can purchase with your WebBank/Fingerhut Advantage Credit Account, you may redeem any available, unexpired Payment Rewards. Can I earn Payment Rewards if I am in an active SafeLine benefit period? Yes, you will continue to earn Payment Rewards at 10% of your SafeLine benefit payment amount -- just as if you were making payments. Can I redeem Payment Rewards if I am in an active SafeLine benefit period? No, you cannot use Payment Rewards during an active SafeLine benefit period because you are not authorized to make new purchases with your credit account. Once your benefit period is over and you can use your credit account to make a purchase, you will be able to redeem any available, unexpired Payment Rewards. Will I lose a Payment Reward if I am in an active SafeLine benefit period when they expire? A Payment Reward may expire and not be available for use if you are in an active benefit period and cannot use your credit account to make new purchases.